I uploaded the initial of each girl with the free upload offer from the link above, and placed an order for each girl. It was separate orders but they were free and the shipping was minimal. I originally tried to change the color of the letters in Paint but it wasn't letting me, so I just went for it as is since I had plenty of paint in my wedding colors at home. 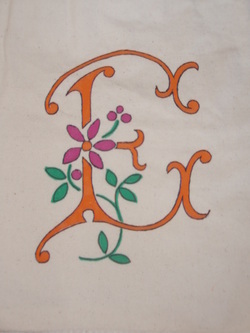 This bag is for one of my flower girls Ella she likes orange so she got orange and Elaina will get a fuchsia E. After it was painted I traced the edged with my handy dandy Sharpie pen to give it more finished look. 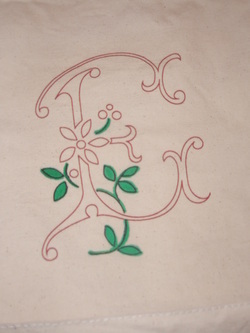 Since the letter was orange the flower I chose fuchsia. Same trend after it was painted I traced it with the Sharpie pen. 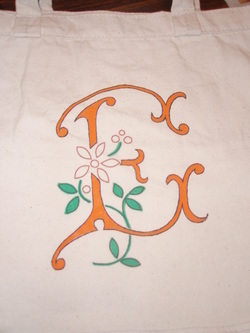 For the bags that have fuchsia letters the flowers were orange. 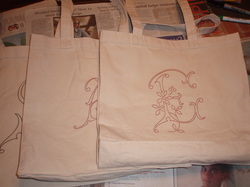 My bridesmaids and flower girls each get a tote with other goodies. 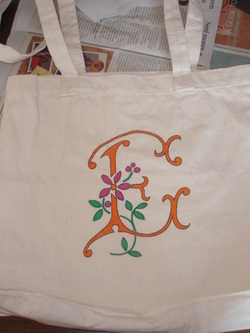 Ella's bag is done...a few more totes to go! 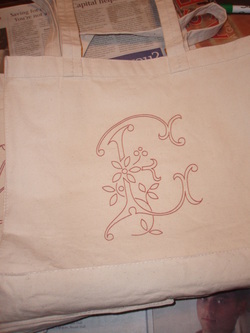 Here is my tote...a few doileys laid out and I was ready to paint over to leave some design behind.